Anyone lucky enough to have traveled to Vietnam knows its cuisine is among the best in Asia, characterized by its delicate flavors and fresh local ingredients. 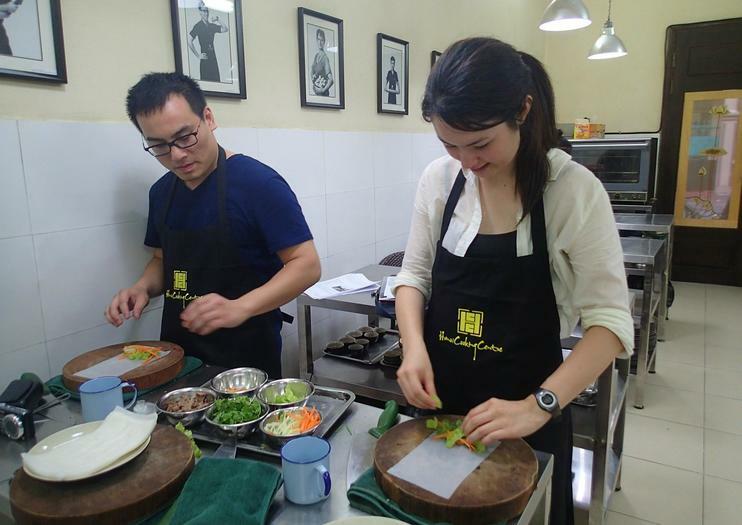 At the Hanoi Cooking Centre, visitors can learn the secrets and techniques used in preparing traditional Vietnamese dishes so they can be recreated back home. A typical half-day cooking class at the Hanoi Cooking Centre begins with a visit to a local market, where students learn about typical Vietnamese ingredients (and how to buy them). Back in the kitchen, students pair up for a hands-on lesson before sitting down to sample their creations for lunch. Class themes and dishes vary from day to day and might cover Vietnamese street food, food from Hanoi and the Northern Highlands, food from the coast, vegetarian dishes, spring rolls, barbecues and salads. The school also offers international cooking classes and classes for kids. Call the school to find out what’s on their calendar for the day before you register. Vietnam is renowned for its unique cuisine and this 4-hour cooking class at the Hanoi Cooking Centre will let you in on the secrets of Vietnamese cooking. Shop for ingredients at a traditional wet market with your guide, learn to make an array of Vietnamese dishes including street food favorites and seasonal specialties, then sit down to enjoy a delicious home-cooked lunch or dinner.